Emus are native to Australia and belong to the Ratite family, as do ostriches (native to Africa), rheas (native to South America), cassowaries (native to Australia) and kiwis (native to New Zealand). 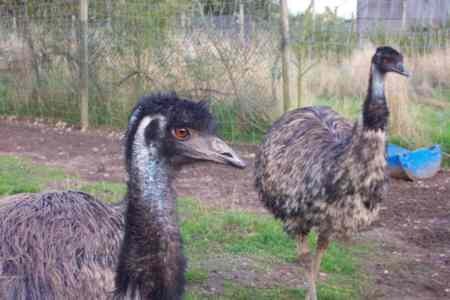 Emus may be kept for pleasure or farming and are now farmed in many countries worldwide, including New Zealand, Canada, USA, Mexico, Japan, Belgium, France, Scandinavia, UK and others. Domestic farming of emus is relatively new, about 12 years in America and more recently in the UK. Ostriches have been the forerunner in the farming of ratites but emus are smaller, hardier, not aggressive and easier to rear successfully from chicks. Emus are very inquisitive, however, they are also quite nervous and can therefore easily be frightened by sudden movements or noise. They are generally docile birds and not naturally aggressive. They soon get to know who feeds and cares for them and they quickly learn the daily routine. They are hardy in our variable British weather, often choosing to sit out in rain or snow rather than go inside. They don't like days with strong, cold winds and rain. Like most of us, they enjoy the sunshine. On a warm sunny day, they potter happily around their pen eating, drinking or sunbathing. Emus do not need a lot of space; although the more space they have the less likely you are to have squabbling at breeding time. Remember, like all living things, emus are individuals. They vary in their behaviour, appearance and performance.